Receive efficient pile installations and testing from the specialists. 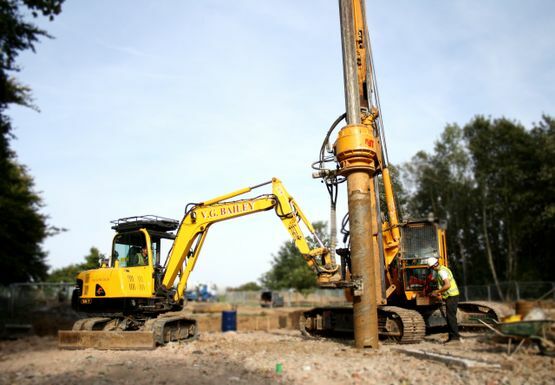 V G Bailey (Contractors) Ltd. in Rayleigh, Essex, has the capability to install open bore, temporary casing, and drop hammer piles. Concrete cubes can be supplied upon request for your convenience. We are based in Essex, however we are able to mobilise quickly anywhere in the home counties including Kent and Surrey. Our largest rotary piling rig weghs 30 tonnes and has a maximum drilling depth of 30 metres. Our team of professionals install 350mm to 1.4 metres diameter piles. A piling mat is required for this machine to keep it stable in its working position. This machine also offers temporary casing methods of piling up to 20 metres. The temporary casing methods described above prove invaluable when drilling through loose strata in the upper levels and drilling into clay in the sub levels. Despite its size, the large rotary piling rig is able to drill closely to existing buildings while the headroom is still available. Also, this machine is able to lift its auger higher than most piling rigs of its size. It allows the auger to be lifted above temporary casings and tiered sites. Our hard-working team also provide a range of mini piling services. Ideal for one-off houses due to its lightweight crawler base and manoeuvrability, we offer a 21 tonne rotary piling rig. Depending on surface conditions, this machine can operate without a piling mat and save you money. With a maximum drilling depth of 20 metres, we offer 300mm to 1.1 metre diameter piles. CONTACT US IN RAYLEIGH, ESSEX, TO ACQUIRE MORE INFORMATION ABOUT OUR PILE INSTALLATIONS AND TESTING. Our largest rotary piling rig weighs 30 tonnes and has a maximum drilling depth of 30 metres. Our team of professionals install 350mm to 1.4 metres diameter piles. A piling mat is required for this machine to keep it stable in its working position. This machine also offers temporary casing methods of piling up to 20 metres. Ideal for one-off houses due to its lightweight crawler base and manoeuvrability, we offer a 21 tonne rotary piling rig. With a maximum drilling depth of 20 metres, we offer 300mm to 1.1 metre diameter piles.